The BCB Choir Ensemble performing at Novemberlicht. Credit: Marga Hattingh. As the days grow increasingly shorter, colder, and bleaker in Berlin, it can be tempting to shut oneself inside and despair at the absence of light and life. But despair not! Christmas markets, song, and snowfall accompany the Wintertime; with the cold and darkness comes the opportunity to better appreciate the warmth of fragrant glühwein cupped between thawing fingers, the sparkle of fairy-lights, and the intimacy of shared body-heat. 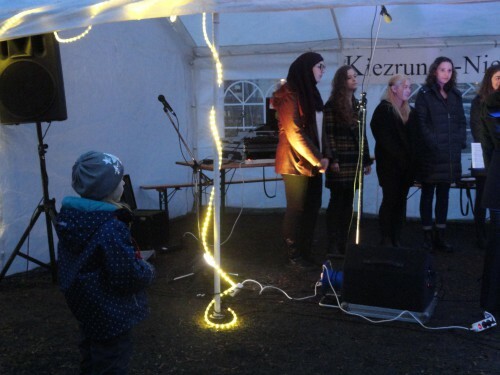 My first experience with a Christmas market came the Saturday before the first snowfall here in our very own Niederschönhausen in the form of the fourth annual neighbourhood Novemberlicht festival. I, along with many other BCB students who had bundled themselves up for the occasion, traversed the fearsome distance separating our campus from the local Rewe to watch the school choir’s first performance of the semester. The festival provided the perfect opportunity for the school to show engagement with the Niederschönhausen community and to show off the talent of our students. Giggling children, BCB student spectators, refugees, and our friendly Pankow neighbours gathered around the performers as their song infused the air with warmth and cheer. I could tell by the huge smiles gracing the faces of the other BCBers who had come to watch that we were unanimously proud of their sweet harmony. Of course, such harmony does not come without work. “We rehearse twice a week. Sometimes we rehearse […] all together, and sometimes we rehearse the groups separately — sopranos, altos, and the male voices — and sometimes we do individual training,” Claudia Jennings, this semester’s choir director, tells me. The difficulty in sounding “put together” is that every semester the choir is “a different group” comprising people of different levels of experience and dedication. Nonetheless, Claudia says she enjoys her time with what she describes as a “very nice group” of students with “some very special voices”. On behalf of everyone who was there to enjoy it, I’d like to give a big thank you to the choir and to Claudia for the effort they have put in this semester to make such a performance possible and for sharing their voices with our community.